A child's First Holy Communion is one of the most important events in their life. Help them make the day extra special with the gift of a First Communion Rosary. 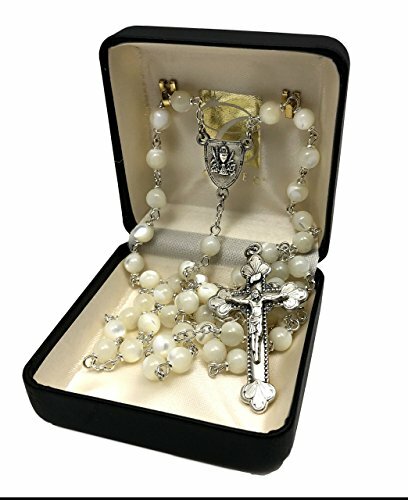 This rosary is a perfect gift for any Communicant and perfectly captures the joyful spirit of their First Communion Day. This exclusive rosary collection features Creed® Heritage crucifix and gorgeous pearl 6MM beads. Perfect gift for his or her special First Communion day, our First Communion rosary collection is sure to be a hit in your store. Each one is beautifully gift boxed in a Creed leatherette rosary box. Beautiful 6mm Real Mother of Pearl White Beads-Loc-link constructed wiring for added durability and strength. Back of the Centerpiece reads "In Remembrance of My First Holy Communion"